That paradigm of integrity, the New York Post newspaper, is in hot water again–and this time the seas are deadly. Make that subways. 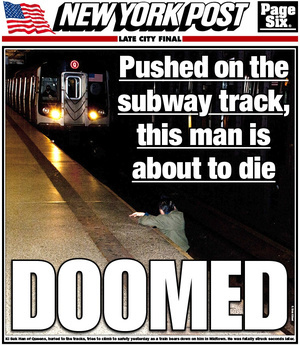 Seems the Post published a photo on its cover, of a man about to be killed by a moving train. Check out the story here. This entry was posted on December 4, 2012 at 9:56 am and is filed under General Interest. You can follow any responses to this entry through the RSS 2.0 feed. You can leave a response, or trackback from your own site.